Risikatu Uthman, a 14-year-old student of a public secondary school in the Ikorodu area of Lagos State who got missing about two months ago, has been found. She reportedly returned home on Thursday, saying she was abducted by human traffickers, who allegedly sold her to Burkina Faso for pros-titution. The Punch had reported that Risikatu had gone out with a boyfriend in June 2018 and did not return home. The police had arrested the boyfriend, a motor boy, who insisted that he was innocent. The lover was arraigned in court as Risikatu’s family intensified prayers for her return. 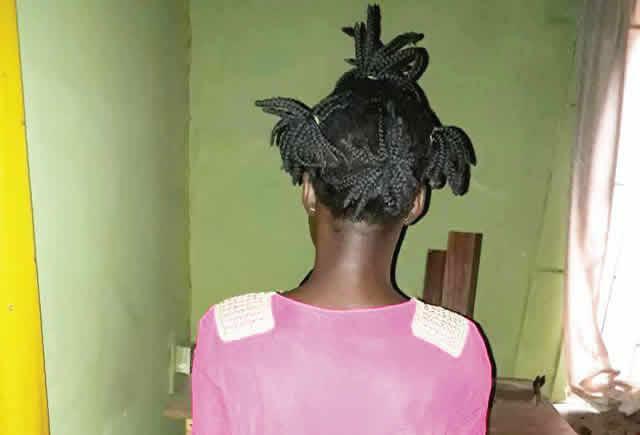 The teenager, however, was brought home by a Good Samaritan, who reportedly found her roaming in Cotonou, Benin Republic. Risikatu alleged that a policeman, identified as Rasheed, abducted her while she was heading home from her boyfriend’s place. She said, “I was returning home on a motorcycle when the man stopped me on the road. “He said I should follow him, that he had something important to discuss with me. I told him that I was running late and my parents would be worried. He insisted that I followed him and I did. “When we got to his house at Odo Kekere, Ikorodu, I saw eight other young girls in a room. Immediately I entered, somebody locked the door from behind and nobody could go out. The victim said she spent two weeks in the house with the other girls, adding that Rasheed’s mother, who was a madam in Burkina Faso, took her information to procure a passport for her. Risikatu said, “After two weeks, we were taken to Shaki, Oyo State. We were taken to the house of a man called Taofeek. We were paired; each group was put in a room. After one month in Shaki, Risikatu said they were put in a bus en route to Burkina Faso. The victim said they spent four days on the road before they arrived at their destination. “We moved on Monday and got to Galasi, Burkina Faso, on Thursday. The woman came to meet us at the park and took us to her house. “We saw other girls, including the ones who had given birth to children, in the house. There were three underage girls in the room as well. We called the woman Mummy. “On Friday, we cooked and ate. By evening, they said we should take our bath. We were then dressed up in skimpy clothes with a lot of make-up. By then, they had loosened my hair and given me wigs to put on. We went to work and I came back with 6,000 CFA. “On Saturday, we went to work as well. I made 7,000 CFA. We were given 20 condoms per day and mandated to use them all. We were told that if a man’s condom bursts, we should collect 3,000 CFA from him. “On Sunday, the woman said we would swear to an oath that we would not betray her. We went to an alfa’s house and were called in one by one. I was the first. “I was made to carry a calabash with some fetish materials in it. The man said I should recite incantation with him, after which he gave me a kolanut and alcohol to drink. But I did not swallow them. I spewed them out when we finished. “During the oath taking, I was made to swear that I would not betray the woman and I would pay her 1.3m CFA (N815,000). He said I must pay back her money and if I betrayed her, I would be miserable and die,” she added. She said after they left the cleric’s house, they were asked to dress up as usual and take to the street to look for customers. Risikatu said, “I had worked for some time and made up to 7,000 CFA when a woman dragged me to a corner and asked if I wanted to stop the work I was doing and I said yes. The lady left me to continue the work. It was said that the police were later informed and the victim rescued. The Punch learnt that Mummy, upon discovering that Risikatu had been rescued, fled her house with some property. Risikatu said the police took her to the Nigerian embassy along with four other rescued girls, consisting two sisters and twin sisters. At the embassy, the officials were said to have identified the 14-year-old, saying they had seen a report on her. She was reportedly profiled with the four others as the officials issued them tickets and passports for their travels back to Nigeria. After a driver conveyed her to Jonte park at Cotonou, Benin Republic, she said she met a trader of Ago Iwoye, Ogun State descent, who promised to assist her because her (Risikatu’s) mother hailed from the same town. After hawking chewing-stick with the woman and sleeping at the motor park for two days, she returned home to her parents. “The way Nigerian girls are treated in Burkina Faso is terrible and it is because we don’t have a good government. I have learnt that if anybody asked me to travel out, I should never follow the person,” she added. Risikatu said one Basirat, another Ikorodu resident who had been declared missing for some time, was in Burkina Faso. The victim’s mother expressed joy at her return, saying she had gone to different prayer houses for Divine intervention. It was learnt that the case had been reported to the Ikorodu area commander, who ordered a manhunt for the suspects. The Punch gathered that the alleged policeman had been arrested with his accomplices. The state Police Public Relations Officer, CSP Chike Oti, however, said Rasheed was not a policeman.